The town criers of the middle ages were the mass communication devices of their day. They provided the only means for common folk to access official news and information. It worked like this. An officer of the court walked through his medieval town, or stood on a castle watchtower, rang a bell, and bellowed Oyez (Hear Ye), Oyez, Oyez and then read the king’s pronouncements to the gathered (largely illiterate) crowd. It worked well enough at the time, in that journalism was on the verge of being invented. The word. From on high. While the craft of delivering news changed over the years… there still was (and is to this day) that Oyez moment. Once each day in America, in the early evening, a distinctive musical cue at the beginning of a news program indicated information was about to be delivered. A bell no longer sounded. The town crier no longer stood on the castle wall. He (and later she) sat behind an anchor desk and broadcast to the populace. 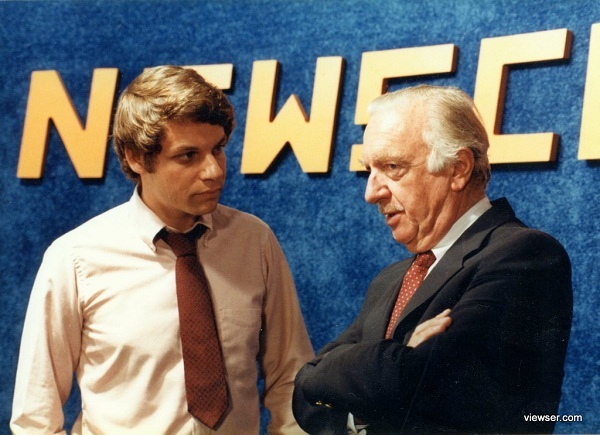 CBS has been broadcasting The Evening News since 1948 – and at one time its pioneering anchor Walter Cronkite – because of his fairness, experience, drive and delivery – was considered the most trusted man in America. By the way, that’s Walter, on the set of Newscenter 11 in Fairbanks, Alaska, speaking with a young news director about how one should cover news on the last frontier. Uncle Walt was the go-to guy in America. Every weekday night, at the same hour, THE NEWS was delivered. And we were glued to this parade of images, stories, pronouncements and features. This was how the bulk of Americans got our information. The important stuff we needed to know. A president could say he was going to hold a news conference. And it was on the show. A mass murder or a declaration of war or economic meltdown or civil disturbance. It also went on the show. But so did big sports, little features and feel good stories. A single snapshot of the world. Filtered through assignment managers, editors, producers, anchors, news directors and an entire curatorial apparatus to try to produce at least a semblance of perspective and relative importance. Information now arrives to many consumers in an always on-stream. And while they do get a snapshot dose of data, that snapshot may not be served with any semblance of perspective or relative importance. So depending on who you follow, and when and where you dip into this flow of information you might get a bit of the news you need. Or not. 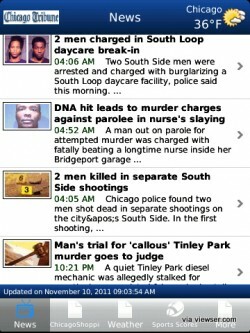 Here is what I saw this morning on the mobile stream of the Chicago Tribune. That stream could conceivably be read by voicing software now or soon to be readily available. Now if you read this first thing in the morning as I did today, you would get a distorted sense of your home town. 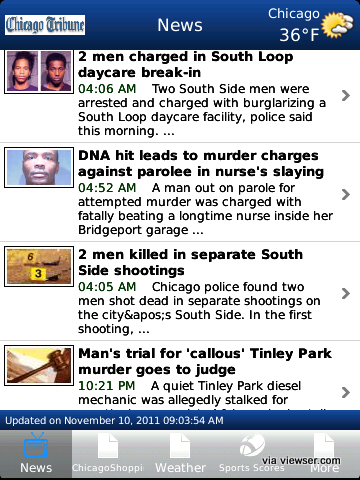 This can’t be all that is happening in the city of broad shoulders. A burglary and three murders overnight? And this is the stream published by one of the great newspapers in America. In recent years internet has almost replaced the TV as the source most people turn to for news. Content providers need to structure their streams more like complete newscasts – providing a balance of stories -mixing news with features, politics, environment, investigative, human interest, financial, and the like. Consumers of straight feeds, like Facebook or Twitter streams, need to know that every time they dip their ladle into the soup, they are getting a taste… but as likely to get rocks as they are veggies, noodles, or beef. Less and less of what passes as news is actually responsibly curated. Many outlets are decide to commission news stories based on trending popular opinion, ease of creation or ability to wrap commercials around the content. Bias has always been part of the newscast. It started when the king wanted only his word revealed to his loyal subjects. Then came the golden age of broadcast journalism, and attempts were made to scrub out the bias – but despite their best efforts – that bias still existed but in less explicit ways. Now, as the vetting and curation process devolves due to economics – and the stream replaces the snapshot – and crowdsourcing replaces a professional staff – who knows what you are getting.